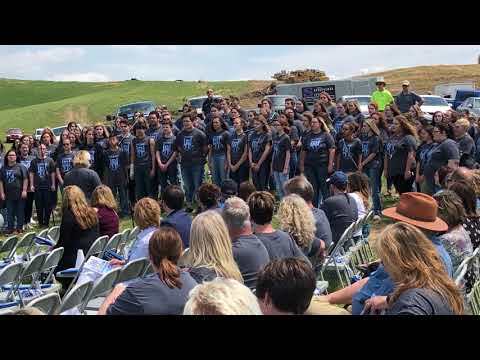 “Yesterday is a shadow, now the future looks bright” — combined chorus of Sullivan Central, North and South high schools singing “Fly with Me” by Mark Hayes. 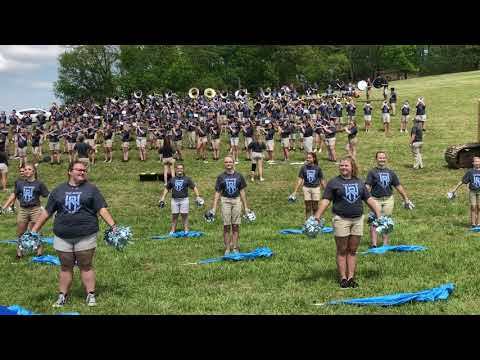 BLOUNTVILLE — Welcome to the Ridge, home of the Wolf Pack. The more formal version is West Ridge High School, home of the Wolves. 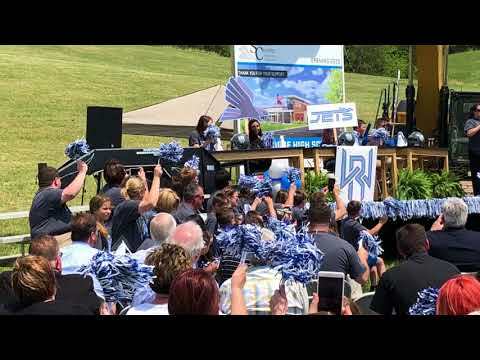 Sullivan County students, teachers, employees and officials broke ground for the new school on Lynn Road Friday, when the Wolves mascot was revealed to be the choice over Hawks and Jets. The colors are sky blue, charcoal and white. The $60 million facility and the $20 million Sullivan East Middle School, for which ground was broken in November, will be the first new county schools in about 40 years when they open in 2020 and 2019, respectively. The site of the high school is off Exit 63 of Interstate 81, near Tri-Cities Airport. West Ridge will replace Sullivan North and South, both of which opened in 1980. It also will replace some or possibly all of Sullivan Central, which opened in 1968. South and Central will become middle schools, while North has been sold to Kingsport for $20 million as a replacement for Sevier Middle. Both new county schools were funded from a $140 million county bond issue, which also sent funds to Kingsport, Bristol, Tenn., and Johnson City Schools, based on their proportional shares of student population. During a prayer at the noon groundbreaking, Colonial Heights Middle School student and school naming and branding committee member Fletcher Gibson prayed for unity for the new school and for it to put behind it conflicts from old rivalries. “It’s a lot of fun to see all the schools come together,” said South freshman Charlie Landry, who will be in the first West Ridge graduating class in the spring of 2021. Charlie and his friend Riley Woods sang in the Central, North and South joint chorus Friday, but Woods had a different perspective. “I guess it’s going to happen now,” freshman Riley said, explaining that he fears the new school might have a diminished football spirit and larger classes. “Small classes do tend to work better,” Riley said. However, Sullivan Gardens K-8 fifth-graders Joe Chapman and Cora Caldwell said they will be excited to attend the new school when their time comes. “I really wanted the Wolves,” Cora said of the mascot choice, which the school system did not divulge publicly until Friday’s ceremony. Director of Schools Evelyn Rafalowski said more than 65 percent of those polled online supported Wolves. Board of Education President Michael Hughes said the new school will be the site for a “lifetime” of traditions and rivalries for the students in attendance, as well as their children and grandchildren. He also thanked Cain Rash West and LS3P Architects. Hughes said the new school will offer 14 of the 16 nationally recognized career clusters in career technical education, with the other two to be added later. Students also will have the opportunity to earn the following college credits: 27 in welding, 33 in machine tools, 24 in emergency medical services, 29 in aviation and 26 in computer-aided designed. Rafalowski said the school will have health occupations, optometry and dentistry programs, as well as flex lab space with yet-to-be-determined programs, as well as engineering and 18 to 20 Advanced Placement courses. She said duplicating such programs across the four current high schools is all but impossible and that students at Sullivan East and West Ridge will have access to the same programs and classes. In addition, she said the school hopes to collaborate with nearby Northeast State Community College, using its facilities during the school day and offering West Ridge facilities for use by Northeast in the evenings.